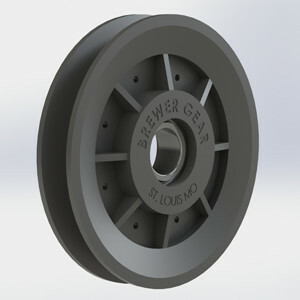 Available for use with most popular sizes of V-belts ("O", "A" or "B" sections), Brewer V-belt Idler Pulleys are provided with a series of radial reinforcing ribs to prevent deformation caused by the wedging action of the belt. 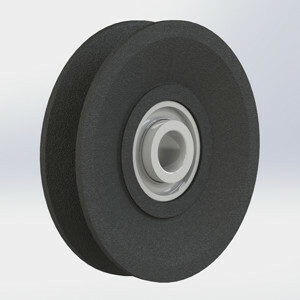 The smooth and durable grooved surface promotes perfect tracking and ensures quiet, long-lived operation. Molded construction provides a bright, attractive appearance that speaks of the high quality of the final product. Plus, versatile bore adapters can be factory-installed to facilitate mounting (see page 22).